My friends, we have now gone through TWO football seasons together, studying and learning with gusto the fine points of the Chip Kelly spread offense and many of the new emerging concepts and tendencies. There are some amazing plays and strategies from this last season that I could not discuss each week due to space/time limits, but I plan to pull those interesting tidbits out to share and to ponder during the long off-season. In the past two football campaigns we have seen new running plays and some innovative blocking ideas, but nothing like what I am about to show you. It is a variation spun off a prior strategy, and yet has it roots in the Chip Kelly we all know. Prepare for the Dual Triple Stack Formation! 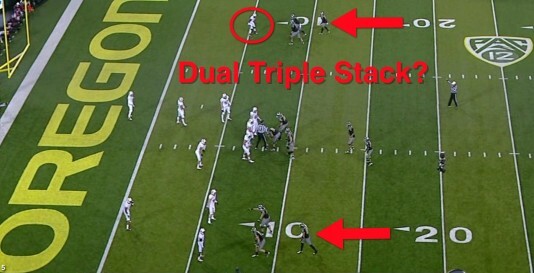 We are familiar with the new Double Stack formation above from our coverage earlier in the season, and Oregon pulled it out again inside the red zone. (Yes…I know it is the Stanford game, but we learn from losses as well as wins.) 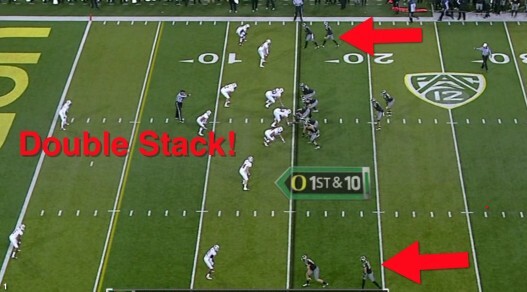 It features receivers lined up on each sideline “stacked” one behind another. 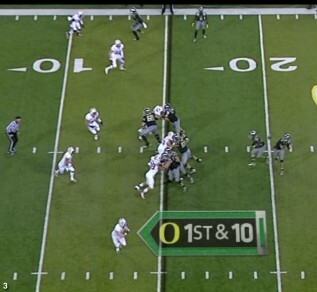 Teams don’t like to put so many defenders out on the wings because Oregon will turn and slash them between the tackles with the Inside Zone Read plays. We see (above) how the Cardinal placed two defenders at the top of the screen up close in “press” coverage to stop the bubble screen, while below we only see one defender up close below with a safety deep (red circle) to help out on other run/pass defense. When the safety is that far back—it is automatic for us to throw the bubble pass we are so known for to that side (picture on right). Will Murphy gets a great block from his teammate Colt Lyerla (above), and turns upfield for an excellent first down gain of eight yards. It is nearly impossible for a safety that deep to come up and stop our bubble pass when we get a good block from the second receiver. It was a great read by Mariota to immediately go to that side. I could scarcely believe my eyes when I was at the game as we quickly lined up in the bizarre formation you see above. We had three groups of “threes” spread across the field, with only three offensive linemen in the middle and three Ducks each at the bottom and the top! 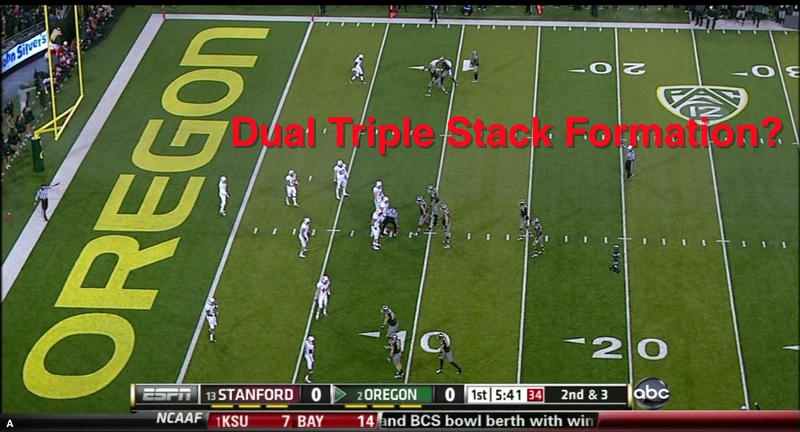 It is the Dual Triple Stack Formation! Note how Stanford was quickly getting three defenders lined up at the bottom to counter our cluster of three below, but only one Cardinal defender was lining up to stop the cluster at the top of the screen – and he was shouting for help! The ball is snapped immediately from our fast tempo and Marcus throws quickly to DeAnthony Thomas on the vulnerable side. 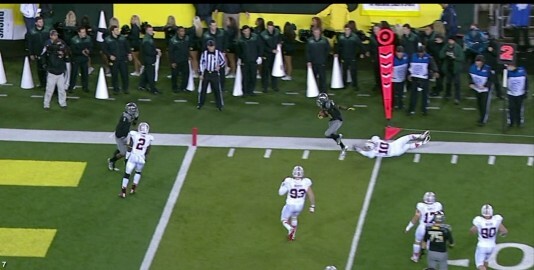 Stanford moved players upward as the ball was being put in play, but too late. Jake Fisher has put his LB defender on the turf, while Josh Huff fights with determination to keep his defender away from DAT to enable the play to pop. 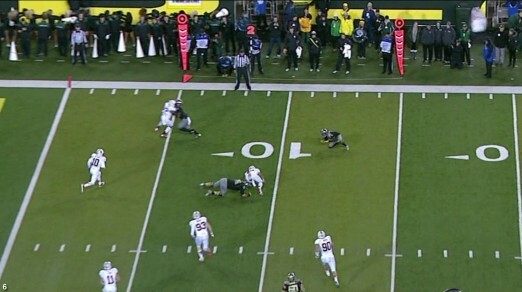 We see how DeAnthony Thomas made the marker and a little more to give us a first down just inside the four-yard line. It may look funny, but that formation is very effective to surprise a defense with our up-tempo play. They have to line up correctly in seconds, and that rarely occurs. Thus, it is a superb idea to pull out in the red zone. Some of you may remember that this play was called back because the pass was too low and DAT had to bend down to catch the ball. 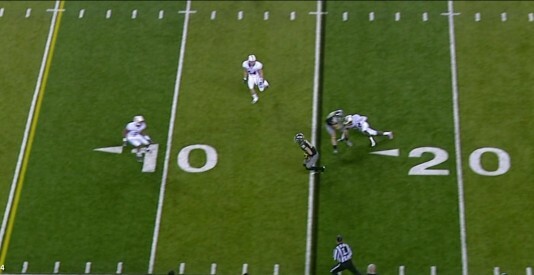 His knee touched the turf (above), thus the play was dead at that spot. It’s too bad, as the Xs and Os of the play, in conjunction with the hurry-up component of our offense, made it a nice new play to add to our arsenal. I’m sure we’ll see it again next year at a most inopportune time for our opponent! My friends…. something about this formation has gnawed at me for the past two weeks. We have NOT seen it before, yet it is like I have witnessed it on the field. 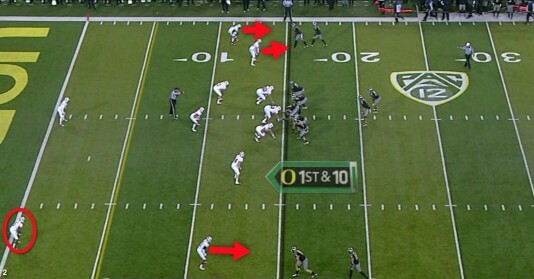 It was like it blended into another Chip Kelly component, but I could not put my finger on it. It was haunting me, and then it hit me as I began to write this report! Here (above) is where I have seen it before! It is our alignment to begin extra point attempts! (Hand slap to forehead.) Now this is the Chip Kelly we know and love! I was laughing out loud at how it bugged me for two weeks when the answer was right under my nose on film. It also answers the question of why we added it; when we add a play, we take one away from our practice. Since this was a play formation that we practice every week and implement every game as extra points—it was easy to add. The formation is familiar and the bubble pass is a routine part of our offense. That is SO Chip Kelly. I love it! As principal of a website with over thirty writers and now over fifty total participants - not to mention a ton of events occurring all the time - I need to take some time to attend to the exciting developments planned for this site in the future. For the next three weeks I will pass the baton to Josh Schlichter (Managing Editor of the Inside Zone Read) who will do an in-depth study of how Kansas State stacks up against our strengths and weaknesses. This will help us as fans to prepare for an explosive BCS game. I will return for analysis after the game and will have some analysis “surprises” going forward. We have stunning expertise in people who are joining our site and share our vision to help Oregon fans learn and have fun doing it like no other media outlet. We have exciting times ahead in the New Year!